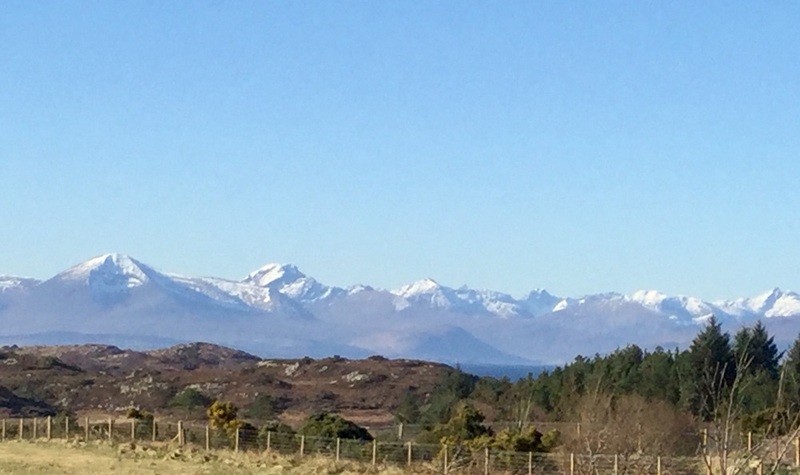 The snow-capped Cuillin of Skye, looking just magnificent. So, for a while I’ve been mulling over the idea of facilitating a series of workshops which draw upon the essence of this special place to inspire creative expression through a range of media close to my heart. When immersed in such awe-inspiring scenery – windfall-foraging the Spring-fresh local woodland or beachcombing the hidden coves for shells, flotsam and jetsam – this unspoilt landscape brings a peace and inspiration which always seems to find its way into my work – either figuratively or texturally in my knitting designs, or literally through my use of foraged and weathered materials to dye or embellish with and to stimulate my imagination. 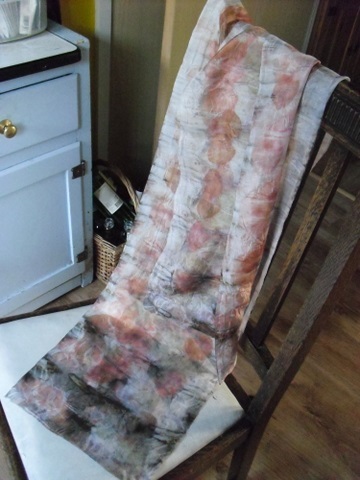 I’ve drawn upon my long, varied and continuing experience of teaching art and textile crafts, to put together a workshop programme which is intended to be a place-based exploration of some traditional and sustainable textile crafts. 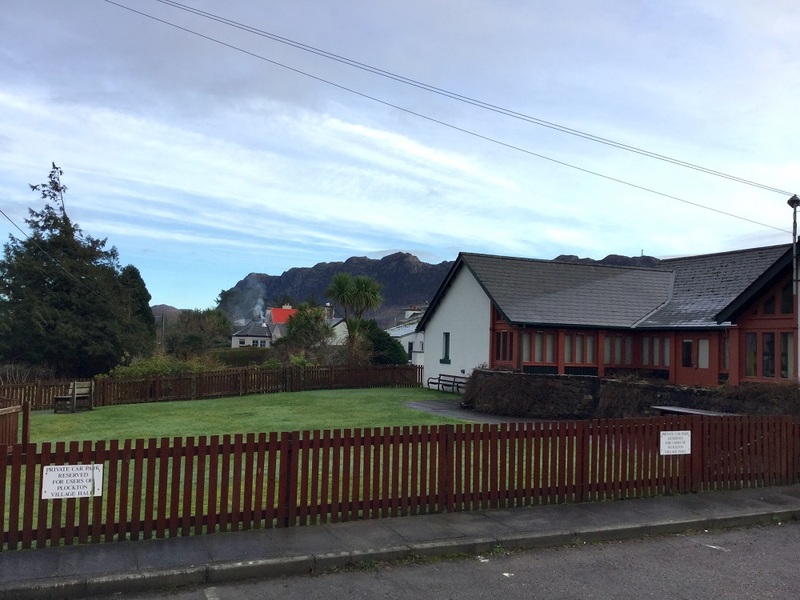 We’ll have the perfect venue: the gallery space at Plockton village hall is a light and airy walled verandah, which leads onto a terrace and lawn – ideal for gathering and making, whatever the weather. We’ll also spend some time out in the landscape, recording or just experiencing the spirit of place. Here’s my 2018 West-Highland Workshops programme; it’s possible to take some workshops as stand-alone day-classes, whereas other workshops are paced over the weekend. More general information is available lower down this page. Contact me for Highland residents’ discount on all workshops! Collect beach treasures in a vintage linen keep bag; dye your bag with indigo, using shibori resist techniques; while the indigo dye works its magic, practise methods to decorate and strengthen your bag using slow-stitching and beach finds. 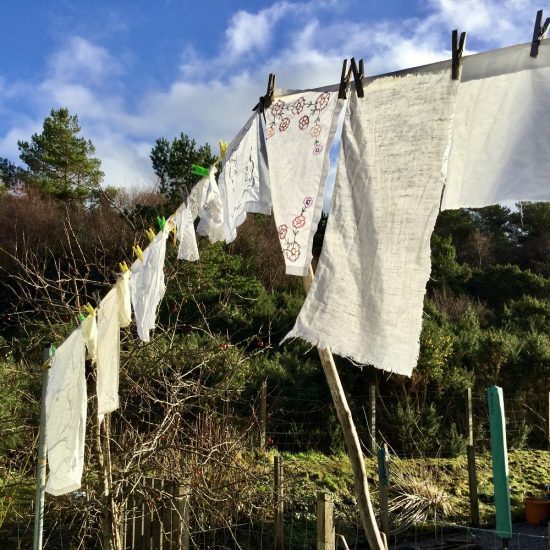 Saturday June 2nd, 10am – 4pm: Shibori Dyeing with Indigo and Madder: Forage or beachcomb for natural resists; learn the theory of mordanting; how to prepare a dyebath and a 1,2,3 fructose indigo vat; explore how to prepare fabric for some shibori resist dyeing techniques; dye cloth to make an infinity scarf. Work outside if the weather is kind. Sunday June 3rd, 10am – 3.30pm: Visible Mending, Sashiko and Boro Stitching Techniques: Practise using some of the tools of the trade to patch, reinforce or simply embellish your clothes; make patches from naturally-dyed cloth to take away, bring in some well-loved jeans, or add the extra dimension of slow-stitching to your infinity scarf if you were in yesterday’s class. Outdoor stitching, weather permitting. Saturday July 21st, 10am – 4pm: Forage the local woodland and footpaths for windfalls; explore some of the methods of printing with the natural pigments in leaves and flowers, including bundling, clamping, steaming, and immersion. Sunday July 22nd, 10am – 4pm: Discover the results of yesterday’s work; practice the Hapazome technique; create delicately patterned scarves and useful pouches. 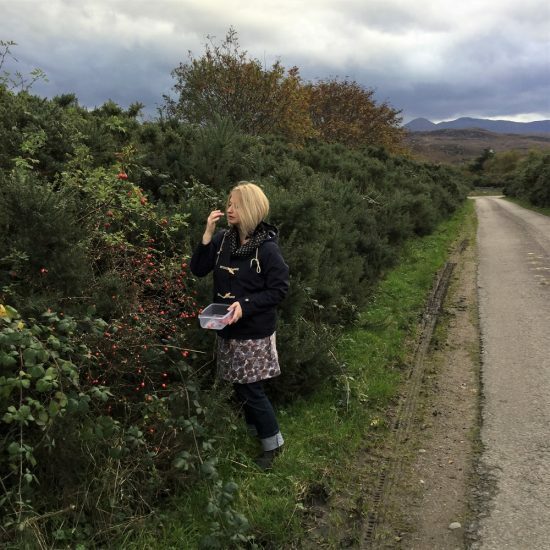 Saturday September 15th, 10am – 4pm: Walk in the landscape and record the natural colours and shapes with art media or photographs, as you choose; design and create a piece in response to the Highland landscape, and practise the satisfying and meditative punch-needle technique. Sunday September 16th, 10am – 4pm: Using undyed yarns and my own naturally-dyed yarns, translate your design to backing cloth and work into it with the punch- needle. This may be kept as a picture, or sewn into a pouch, mat etc later as you wish. All workshop materials provided, but bring your own camera/phone and/or sketchpad and art media. 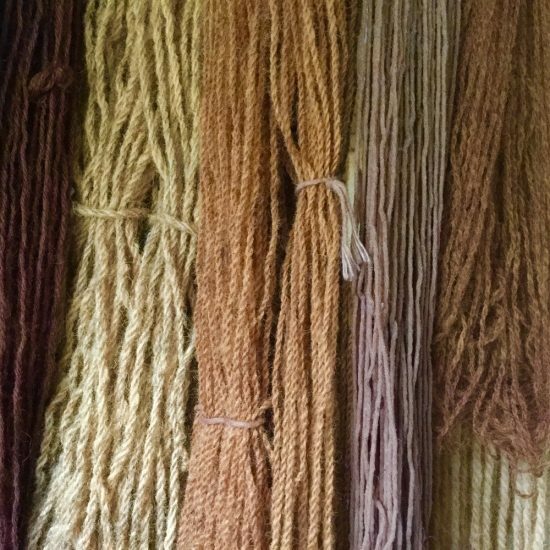 Saturday October 13th, 10 am – 4 pm: Yarn Dyeing with Natural Healers: Many reliable dye-plants are also renowned in herbal medicine for their soothing and anti-inflammatory benefits; we will explore yarn-dyeing processes using a variety of fibres and sustainably harvested natural dyestuffs, to produce skeins to take home. These may later be knitted or crocheted into comforting socks, gloves, hats or scarves, in the colours of the landscape. 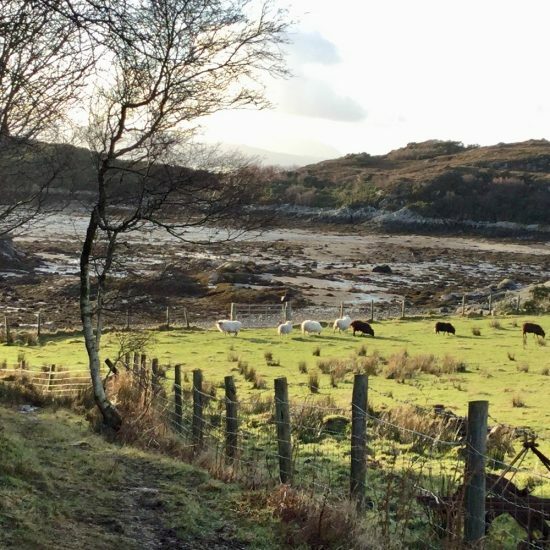 Sunday October 14th, 10 am – 4 pm: Knit the Highland Landscape with Naturally-dyed Yarns: We will take a wander round the wooded headland, recording the colour strata of the Autumn landscape with its mountains, forests, sea-loch and islands. After a warm drink back at base, simple knitting patterns for accessories will be available for us to translate our colour sketches and photos into a response to the landscape, using my own naturally-dyed yarn. All workshop materials provided, except 5mm knitting needles suitable for working small circumferences in the round, your own camera/phone and/or sketchpad and art media. Saturday November 3rd, 10 am – 4 pm: Introduction to Waldorf doll-making: This is a foundation day, where we will concentrate on the most specialist process: making the doll’s head, and forming the instantly-recognisable traditional Waldorf doll features. We’ll use natural materials, including local wool, cotton tricot fabric and plant-dyed yarn, and the class includes complete photo instructions on how to complete the doll with a knitted body. Sunday November 4th, 10 am – 4 pm: (continuing from previous day’s class, for weekend workshop participants): We’ll continue making the doll’s knitted body from undyed or my own naturally-dyed yarn, and learn techniques for stuffing and forming the limbs. There will be patterns and advice for making clothes and shoes for your doll, and examples of my own doll-making as inspiration. All workshop materials provided, except 5mm knitting needles suitable for working small circumferences in the round. 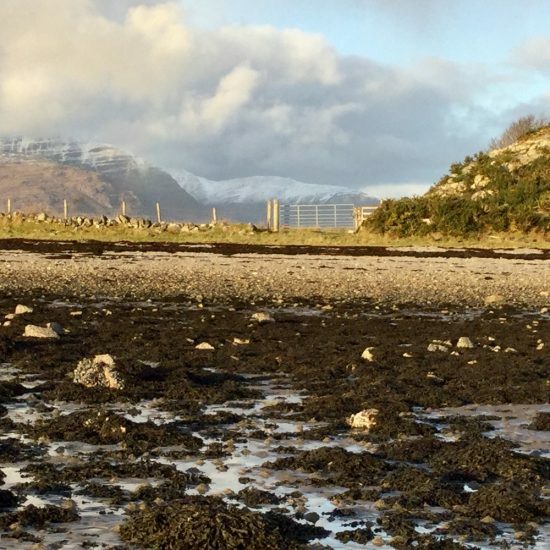 What to bring: Plockton can be a “four seasons in one day” kind of place, and many of the workshops include an outdoor element, so please do dress accordingly. 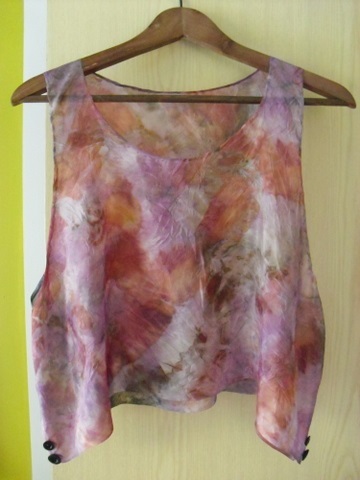 Some of the workshops will involve dyeing, and for these I recommend older, dark clothes, a coverall or waterproof apron, so that you can get creative without thinking about staining your clothes. If we plan to go out, don’t forget your camera/smartphone for photos, and/or sketching stuff, water bottle, sunglasses, notebook and pen and hat if those things will make you comfortable, any medication you may require, and a daysack or similar hands free bag will come in handy. If you have a sewing kit or tools that you like using, do bring them along too. Mobile phone reception is patchy in Plockton and some networks are better than others. Please note that as workshop facilitator, I will not be responsible for participants in any way, outside of the listed workshop times. Please do note that there is a large demand for holiday accommodation in this area all year round, and book as early as possible. 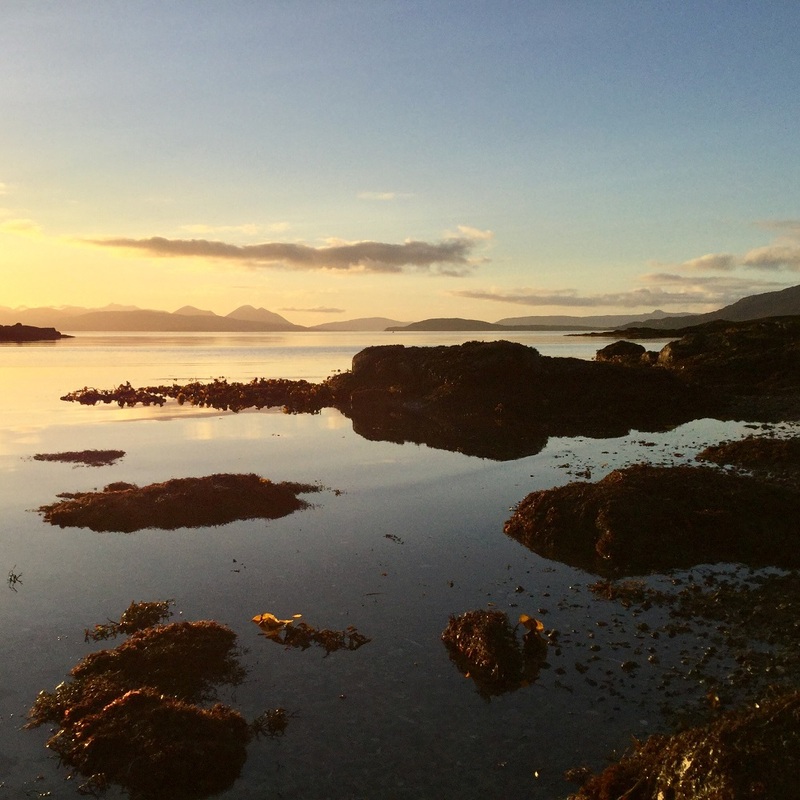 The outlying villages of Duirinish, Drumbuie, Achnandarach and Achmore are only minutes away and also have several B&Bs. If transport between your local accommodation and the workshop venue is an issue, please contact me using the contact form on this website, and I will see how I can help. Meals: During workshops and classes we’ll take breaks when snacks and hot drinks will be available, and a vegetarian meal will be provided at lunchtime. Please let me know if you have any allergies or intolerances – and not just food-related, environmental too. If you have a favourite herbal tea or snack, please feel free to bring along whatever will keep you happy and energised! The hall kitchen is adjacent to our workshop area, and I’ll keep the doors closed to ensure that it stays untainted, but we’ll have access to the kitchen and I’ll create a dining area away from our workplace. Of course, if the weather’s fine, we can enjoy the beautiful views outside. 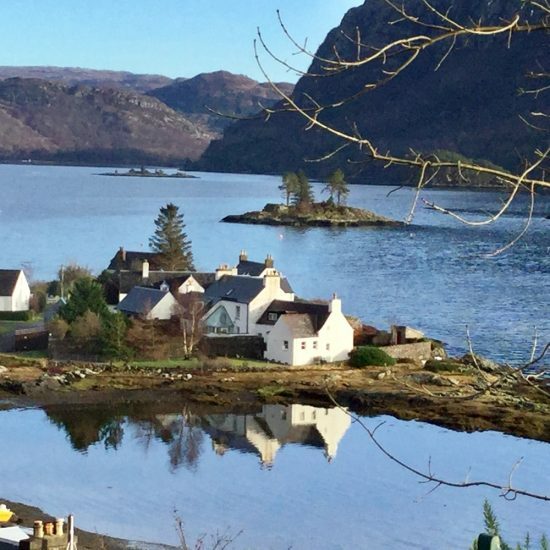 For evening meals, the Plockton Inn, Plockton Hotel and Plockton Shores Restaurant all have dinner menus incuding fresh local ingredients, and there is also the Harbour Fish Bar and Shonzey’s mobile fish and chips for local seafood suppers. 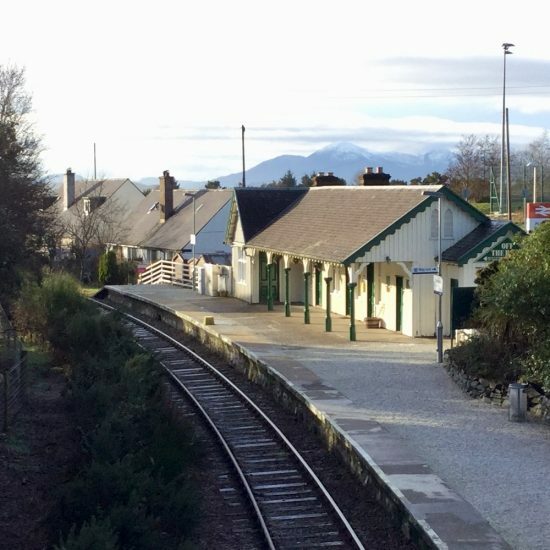 Transport: There is a Railway station on the outskirts of Plockton, about 10 minutes walk from the village centre. Please check the timetable, especially as the Sunday service is very sparse. Coach services (see links below) come to Kyle of Lochalsh, a few miles away, from where you can get the train or a taxi to Plockton – again, you’re advised to book taxis in advance. If travelling by car from the South, you have alternative routes from Inverness, and I recommend checking Google maps and the Traffic Scotland website for alerts of diversions or delays. There are parking spaces reserved for hall users. Accessibility: Plockton hall is an accessible building, and has disabled toilets. Please read the workshop descriptions carefully, and decide whether the activities are appropriate to your abilities; if you have any queries, please use the contact form and I will endeavour to modify the workshop content if at all possible, to make it accessible to you. Looking across to Heron Island from the Brae, Plockton. Looking to Applecross from Dubh Ard.